For those of us who grew up in the 80s playing old-school NES games, Duck Hunt holds extremely fond memories. This is made apparent by the huge amount of Duck Hunt art floating around on the internets. 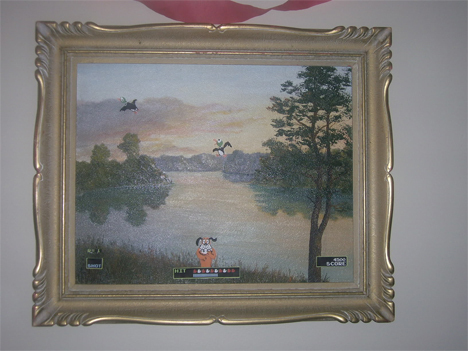 This amazing Duck Hunt painting illustrates the famous scene: pixellated ducks flying away unharmed while that stupid dog snickers in the foreground. 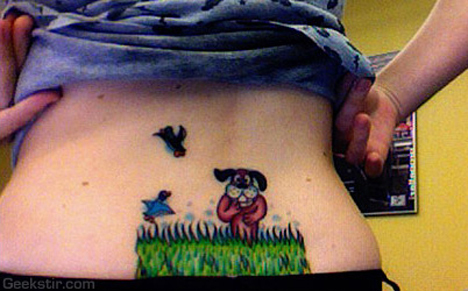 Duck Hunt love is obviously an everlasting kind of love. How better to declare your undying devotion to the 8-bit wonder than tattooing scenes from the game onto your skin? 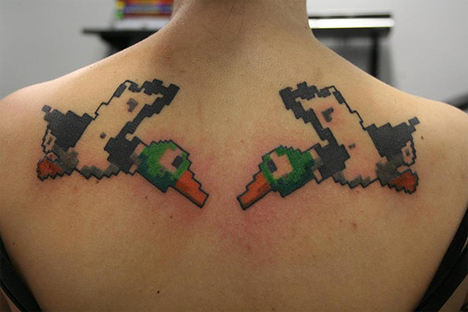 The top tattoo is even pixellated for authenticity – brilliant. 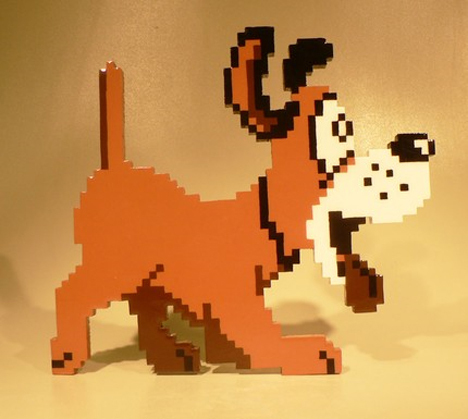 If you’ve ever wanted to own your very own Duck Hunt dog, you’re in luck – Etsy seller pixelparty is offering one for the reasonable sum of $400. Finally, you can be free to shoot him when he giggles at you. 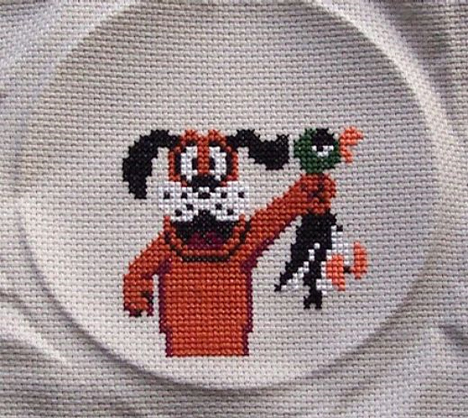 Sadly, Etsy seller johloh is no longer offering this beautifully rendered Duck Hunt cross stitch for sale. But let it serve as inspiration for all you geek cross-stitchers out there: you can do something truly awesome with your talent. 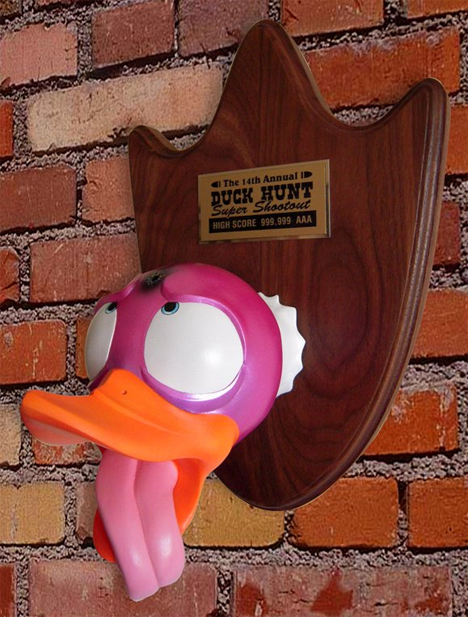 For the truly hard-core Duck Hunt fan, this duck head wall trophy is drool-worthy. Created by artist Eric Tan, the glittery pink duck head (complete with between-the-eyes bullet wound) seems like the perfect revenge for all the times those ducks swerved just out of reach of your plastic light gun. 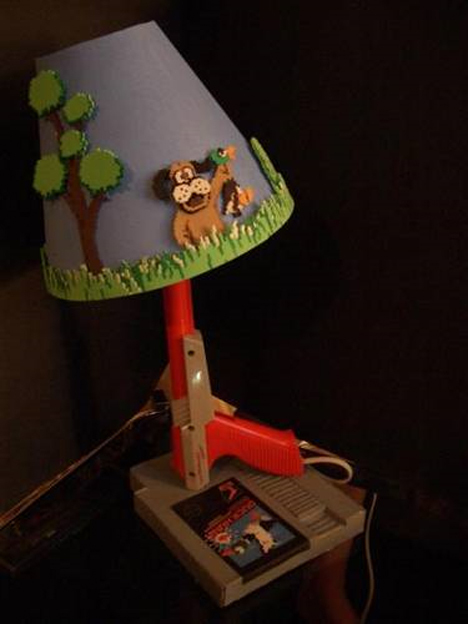 The Duck Hunt lamp is a perfect example of what you can do with some craft supplies, some creativity, and a healthy love of Duck Hunt. An old light gun was gutted for use as the body of the lamp, while a 1.5-scale cardboard game cartridge is the base. Perfectly recreated game scenery adorns the shade – all created by Crafster user Fluffypants. Dioramas are sort of awesome on their own, but when you couple them with a classic video game they far surpass awesome. 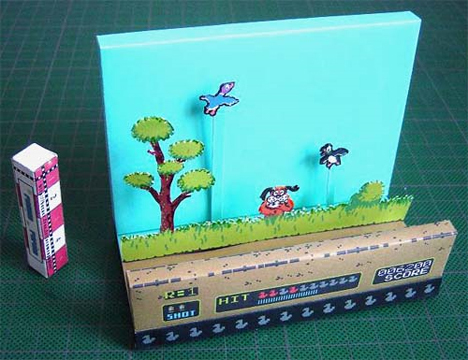 And the best part is that you, too, can download and build this unbearably cool DIY Duck Hunt diorama. So maybe a stuffed plush Nintendo isn’t the most practical thing you’ll ever own. But for Craftster user Blueblythe, it’s undoubtedly the coolest. 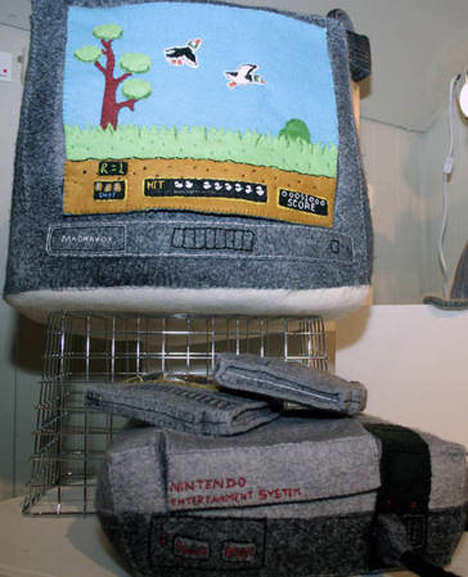 All parts were made by hand, and the stuffed TV has two interchangeable screens to go along with the two interchangeable cartridges which actually fit into the NES console. Ah, the melding of two childhood favorites: Nintendo and Lego. 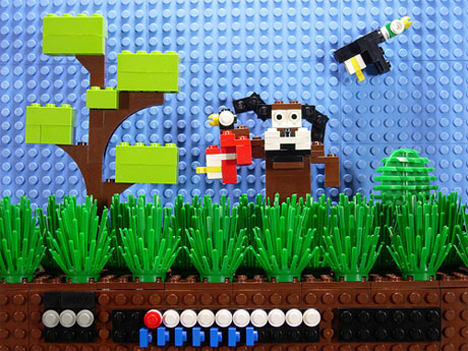 Flickr user (and genius) Skinny Coder has created a wondrous world of video game/Lego tableaus to delight us geeky kids who never really grew up. See more in Gaming & Geek or under Gadgets. September, 2009.